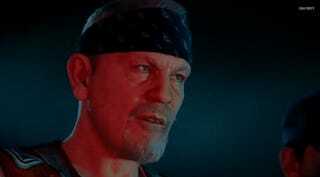 That John Malkovich might take any acting role put in front of him, but he takes them hard. The rest of the cast of next week's first installment of Advanced Warfare's Exo Zombies co-op mode seem cardboard in comparison. Sleepy Bill Paxton, much older than I remember her Rose Mcgowan and The Walking Dead guy don't have much to do here, so the jury's out on their virtual acting chops until I get my hands on next week's "Havoc" DLC drop. Right now it's very much the Malkovich show, and he's nailing it. We might be looking at the next virtual Kevin Spacey here.